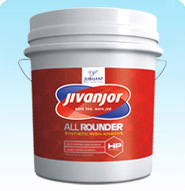 All Rounder is a ready to use premium quality white adhesive specially formulated to give unmatched bond strength, it is also enriched with special preservatives to prevent any bacterial growth during storage therefore providing it with a prolonged life. Bonding soft and hard wood species. Appearance : White viscous Liquid. Viscosity (250C/20rpm/sp.7 300 - 330poise. Bond Strength after 24 hrs. Wood to Wood : 280Kg/sq.inch (min. ).